Xanthippe is an ambidextrous setter, setting both word and mathematical puzzles … or, in this case, both!! First a mathematical to solve, then some numbers to replace with letters and words, and finally an ambiguity to spot and resolve. The across entries consisted of two or three numbers, not overlapping, and the downs were simple clues or identified as a prime. There were 38 two-letter entries, “all of a kind and distinct”, and the ambiguity would be resolved if the two-letter numbers in each of the twelve plates were converted to letters. 38 + 12 = 50. Hands up those who guessed the theme before even looking at 1ac? Well … not me! I had to start at 1ac. As with normal crosswords, I start at the beginning and work my way through the clues in order looking for the way in. 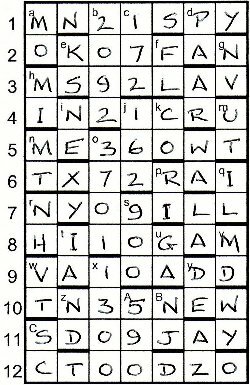 This can be as simple as finding a correspondence between a clue’s location in the grid and the location of any letters used in the clue. Thus, 2ac 30a; 2o (3;4) began with the second and last digit of a, and enabled a to be identified as 13 with 2ac/i being 390. Hopefully other bloggers will step through the solution in detail. I didn’t find it hugely difficult, but even so, took about three hours to get to the end. I listed the twelve 3-letter numbers from the end of each across clue and converted them to letters. Thus 642 at 1ac gave H/S + F/P + D/N/Y, and one of the easier ones popped out … SPY, defined as eye in the preamble’s list of definitions. Others weren’t as easy. 230 at 10ac gave D/N/Y + E/O/Z + A/L/W and could have been DEW, NEW, YEW or DOW, but fresh defined NEW nicely. I don’t know how much living in New York City for six years helped, but as I entered these twelve words, the abbreviations of American states were just staring me in the face. Thus the first two digits of each line could also be converted to state abbreviations, snaking across and down the first two columns of the grid. Of course, I got to the end and stared aimless at the grid looking for the ambiguity. Unfortunately, Arden’s Listener 4075, Square-Bashing was a distant memory! I listed all the states and converted them to digits and then ticked off each one as it was used. I ended up with an extra 21 in the grid but only one 22. ND and NY both needed to be 22. A couple of minutes later, and that pesky SQRT at 7ac revealed itself as the snitch. Great fun thanks, Xanthippe. Will your next Listener be a crossword, a mathematical or a hybrid … or perhaps none of those! This entry was posted on 9 March 2012 at 5:00 pm	and is filed under Solving Blogs. You can follow any responses to this entry through the RSS 2.0 feed. You can leave a response, or trackback from your own site. MN appears twice in your solution. Thanks, Dave, good spot. Now fixed.